Vojna Bastavanovic Casteel working on a mosaic on the façade of a theater in Andricgrad. When Murphy resident, Vojna Bastavanovic Casteel was a child, she was already a very talented artist. She was accepted into a high school for graphic design. While attending the University of Fine Arts in Belgrade, she discovered her passion for mosaic art and earned her bachelor’s degree. She earned her master’s degree in mosaic art under the mentorship of professors Branko Miljus and Djuro Radlovic. When she saw mosaic art for the first time, she said she immediately loved it. “I love everything about stone. Holding something that is millions of years old from this earth and making something new with it. It always impresses me, the colors and new stones. I always find creative ways of how I will use it. Stones are durable and will last a long time.” While in college she earned an award for one of her mosaics. The mosaic was hung in the hallway of the university and still hangs there today. This was her first mosaic to be displayed in a public space. 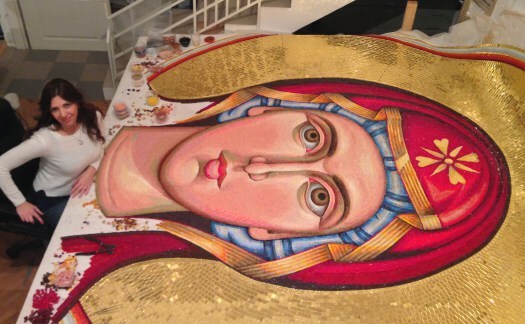 Vojna Bastavanovic Casteel working on the head of the Mother of God which was installed at St. Marks in Belgrade. Djuro Radlovic, one of her professors, chose talented students to work at his studio, Studio Radlovic. She worked there for 10 years with other students. She said she learned everything about mosaics while working there. She learned much about color, proportions, creating moods and creating large mosaics in the studio then moving them to their final destination (indirect mosaic method). Vojna Bastavanovic Casteel creates a portrait of her husband Eric Casteel in her studio in their Murphy home. During the indirect mosaic method, artists glue the stones face down onto fabric. Once that portion of the art is complete, they move it to where it will be displayed and mortar it to the wall. During the process, the artists must calculate how the mosaic will look in situ on the architecture. One mosaic she worked on was ‘Mother of God’, which is displayed at St. Marks in Belgrade. The face alone is six feet tall. The entire figure is approximately 25 feet tall. The mosaic is comprised of glass imported from Venice, some with a 24 carat gold overlay. When the stones are still on the fabric, they can be moved around, however once they are mortared, it is unchangeable. It took three artists one year to complete ‘Mother of God’. She said so far, this is the mosaic that gave her the most satisfaction because of its size and the challenge it presented. She added, “Every mosaic is a new challenge. I’m always experimenting and putting new materials into the pieces. All of them give me a sense of satisfaction.” Casteel moved to Murphy before the mosaic was installed in the church. She plans to return one day to see the completed masterpiece. Through her experience at Studio Radlovic, she learned the rules that different religions require artists to adhere to when creating mosaics. While working at Studio Radlovic, she worked on many large projects. One large mosaic was the top portion of the façade of a theater in Andricgrad at the Bosnia/Serbia border. A producer created this city. He requested many people, some famous, be incorporated into the mosaic. Four artists created this mosaic. They each decided to include a self-portrait of themselves into the artwork. Vojna Bastavanovic Casteel uses the Hammer and Hardie to cut larger pieces of stone. The Hammer and Hardie is an ancient method that was used to cut stone and is still used today. Her husband, Murphy resident Eric Casteel, is very talented and pursues mosaic art as a hobby. He attended mosaic classes in Italy. Eric found Vojna’s website (vojnaart.com) and wanted to buy some of her art. They started a conversation five years ago, and three years ago were married. Two years ago she moved to Murphy. Since living in the United States, she has found mosaic art similar to what she saw in Europe. She has found that most Americans create mosaics as a hobby not as a serious art form. She has always loved animals, and that love, coupled with time she spent in South Africa observing animals in their natural environment, has determined her passion for creating animal mosaics. She recently was commissioned to create a religious icon for a business man. She also had her artwork for purchase at local art exhibits. She plans to teach mosaic classes locally.